Updated: This giveaway is now closed. Congrats to PunkinMama! Thanks for playing! When I was a kid, one of the most exciting things about the holiday season was getting the big Sears Christmas catalog, filled with page after page of awesome toys. I’d pour over the book, circling everything my heart desired. I knew I might score one or two things out of that giant book, but the fun was really in the looking. Today my kids take photos of things they see when we are out at the store and and I add them to their ever-growing wish-lists. They too might get lucky and receive one, maybe two things from their “most-wanted” list. What I’d rather spend my money, and what most parents I know would rather spend their money on is experiences, and gifts that won’t be out of season before the winter break is over. This holiday season, Goldfish Swim School & I are on the same page about giving experiences. 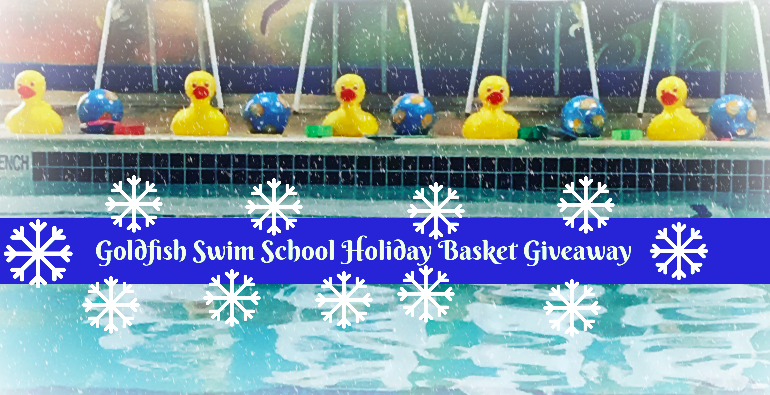 This year’s Goldfish Swim School holiday basket is fun to open and filled with goodies like two months of swim lessons, family swim passes, a winter hat and water bottle. 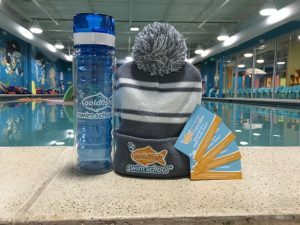 The baskets start at $168 for current members and $193 for new members and they can be purchased at the Goldfish Swim School Fishers or the Goldfish Swim School Carmel. Want a chance to win a Holiday Gift Package from Goldfish Swim School (at either the Carmel or Fishers location)? Just leave me a comment telling me the best non-toy gift you’ve every given or received! I’ll pick a random winner next Weds, November 22! Disclosure: Thanks to Goldfish Swim School for providing this giveaway. My son participates in their program in exchange for my honest reviews. My siblings and I and our families took our parents to NYC one year. My mom had always wanted to go there so we surprised them with the trip one Christmas (we waited until summer to actually go). I received tickets to the final four. That was a biggie. Its not necessary an experience gift but it’s not a toy… my son loves his mamas helper kitchen stool. It allows him to safely stand at kitchen counter height and help me cook or bake. We went on a trip to Florida with my sister and parents. Little did we know my dad would pass away a couple months later. So thankful for the memories! ?? We love giving our kids a trip to an Indiana State Park lodge and spending the weekend hiking outside, and enjoying all the amenities of a State Park hotel! We love experience gifts!! Children’s Museum, Zoo, Connor Prairie, and Goldfish memberahips are our favorite gifts to receive! Previous PostPrevious What Rhymes with 104? Next PostNext Gifts for Tween Girls: Show Us Your Spark MEGA Giveaway!